As I mentioned in yesterday's posts, the baboons will eat insects. We caught this baboon trying to fill up on flying insects. Yum!!!! We met at the Mole Park information center around 6:45 and get assigned a guide to take us on safari. Whit mentioned that he had used James in the past, and had a good experience. Come to find out that James in on leave. We ended up getting assigned to Osman, who was awesome as a guide. More on him later in the post today and tomorrow. So as we starting our walking safari, there were the first animals that we come upon. A warthog family!! A few minutes later we come across this on the side of the road. According to Osman, the track is recent. Given that Osman has been doing this for the past 11 years, we have no reason to doubt him. Here is Osman trying to figure out which way the elephants are going. It was amazing how he tracked the elephant. There would be times when we would stop and he would look at the ground for clues. For example, he would look at some tracks and say this is old. Or look at a piece of broken branch and know how long ago is was broken based on how much moisture was still in it. A couple of times we lost the tracks, but he used other clues and his experience to continue on. The elephant has huge feet. Don't want to get stepped on by one of those. About about 25 minutes of Osman tracking, we saw this. A few steps later this was the view. Elephants!!! We were able to get within about 30 yards of them, which we found out later is a lot closer than most guides allow. Thanks Osman!!!! We left the elephants for a while and went to look for other animals. Not seeing many, we made our way down to near the watering hole. By this time the two elephants that we had seen earlier had made their way down there. After the safari, we were talkign to Osman when we looked over and saw this sight. Good thing we didn't leave anything valuable in the back of the truck or they might have snatched it. After the safari, we went back to the motel for breakfast. While we were eating, a baboon come up and stole food from off the plate of some people sitting next to us. Apparently this has become a big problem at Mole. After breakfast we drove out to a nearby town called Larabanga. 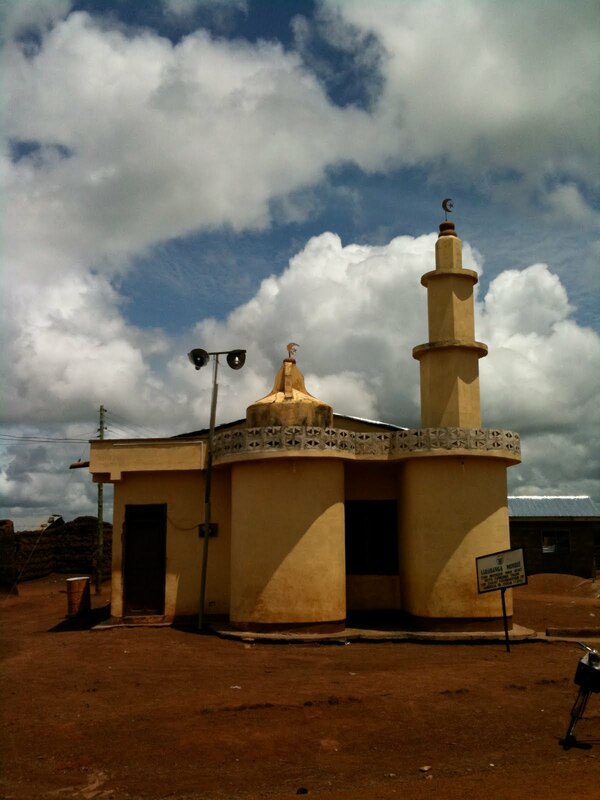 Rumors have it that this town has the oldest mosque in Ghana, which they say is about 700 years old. It has been interesting to note that whereas most Ghanaians are Christian down south, most up north are muslim. 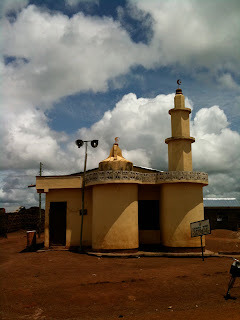 (We have seen mosques all over the place). When we got back to the motel, we noticed that there were several elephants down in the watering hole. Was fun to watch them playing in the water. I thought this picture was only fitting after our experience this morning. Doesn't that cloud look like an elephant? Me with Osman, our guide. I wanted a picture holding his gun, but apparently that is not allowed. For most of the day, we didn't have any electricity or running water. It will be nice to see if there really is any running water at all here. We spent several hours this afternoon out by the pool, relaxing and catching some rays. I was able to capture some awesome shots of the sunset out over the savanna. (Most of these were actually captured with my iPhone. Thanks Apple!!!) Enjoy the rest of the pictures.